Vintage 1955 photo of Paul Frere- Grand Prix Monaco (Europe) 1955 - Ferrari 555 Supersqualo. 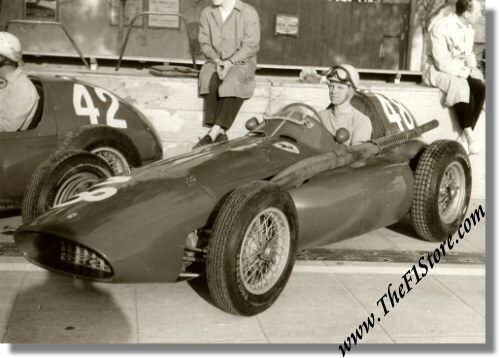 This is a vintage 1955 photo of the great Paul Frere at the wheel of the Ferrari Super Squalo 555 that he would share with Piero Taruffi for the 1955 Grand Prix of Monaco which was named Grand Prix of Europe for the occasion. The duo would finish the race in 8th place (out of 9 finishers...) and not less than 14 laps behind winner Maurice Trintignant on Ferrari 625. The photo measures some 17 x 12 cm or 6.5 x 5 inches. The back carries NO reference to the possible photographer.